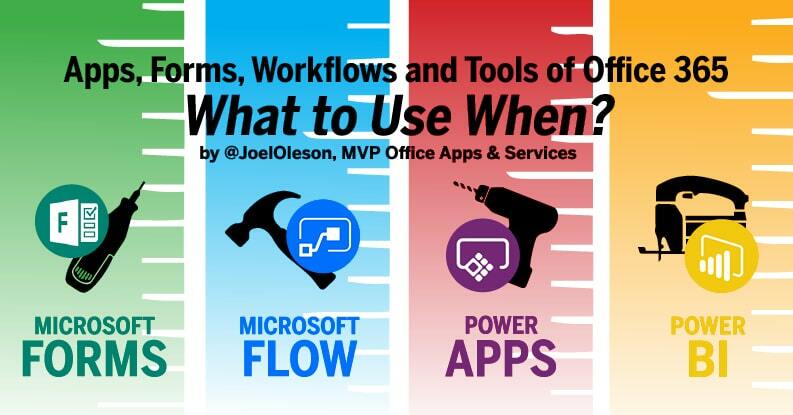 Apps, Forms, Workflows, and Tools of Office 365: What to Use When? Crow Canyon Software recently hosted a webinar with MVP Joel Oleson on what tools to use in Office 365 specifically looking at PowerApps, Microsoft Forms, Flow, Power BI, and how our own product, NITRO Studio, fits in as an approachable third-party solution. While building business applications has never been easier, many people struggle with where to start, which tools to use, and what the limits and capabilities of these tools are. We are providing this page as a resource where we are sharing insights and finding from webinar and other sources. Q: None of the tools that Microsoft has really mimic the functionality found in InfoPath. How long until we see that same level of functionality? A: Don’t hold your breath. Microsoft is not planning on rebuilding InfoPath. Flow, Forms, PowerApps, etc… are their own new creations. You can vote up features, but don’t expect them to rebuild InfoPath… it’s dead. That is why third party solutions like Crow Canyon’s NITRO Studio is getting a buzz. Check it out! Q: Does NITRO Studio have On-Prem options or similar that could be required to meet InfoSec/government compliance? A: Yes, NITRO Studio has an on-premises version that could meet InfoSec/government compliance (SharePoint 2013, 2016, or 2019). Q: Can anyone create PowerApp without a license? A: No. You can’t create or consume a PowerApp without a license. E3 does include license to create or consume PowerApp… it just needs to be assigned if it hasn’t. Q: Can you please provide all the training videos links to know how to use in details of all the Apps, Flow, Form, PowerApps, Power Bi and NITRO Studio– for the ease the use them. If we have any question for support, how can we contact a direct chat with the supporting team? Specifically for NITRO Studio, click here for support. Q: Where is the slide deck shared? 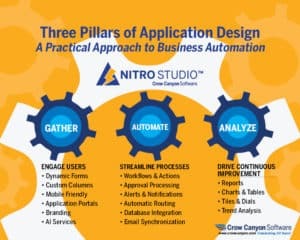 This infographic will help you understand which of the Power Tools to use when… Apps, Forms, Workflows, Reporting, and other third party solutions like NITRO Studio by Crow Canyon Software. Read blog post by Joel Oleson related to this infographic. Microsoft Forms is a basic lightweight app for quickly collecting information via surveys and quizzes, but you should be aware of its limits. When do you use Forms and when do you need a different tool? This Three Pillar approach is the foundation of NITRO Studio™, our application service layer, that powers up SharePoint and Office 365 to become true business application platforms. Read more information on the Three Pillars of Application Design by Crow Canyon Software.